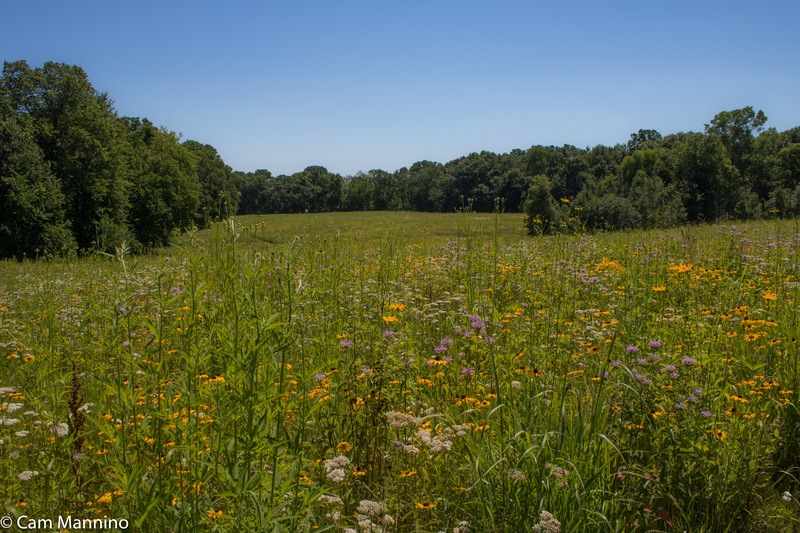 The north and east prairies at Charles Ilsley Park get more glorious each summer as restoration brings the return of colorful wildflowers blooming again in their native soil. 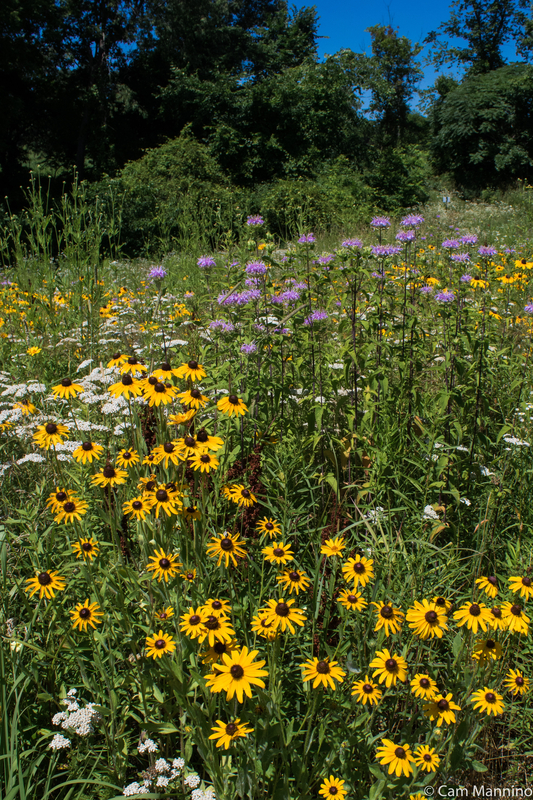 Great sweeps of Black-eyed Susans (Rudbeckia hirta) stare up into the blue sky surrounded by the tousled, lavender blossoms of Bee-balm (Monarda fistulosa) and flat, compact cushions of white Yarrow (Achillea millefolium). 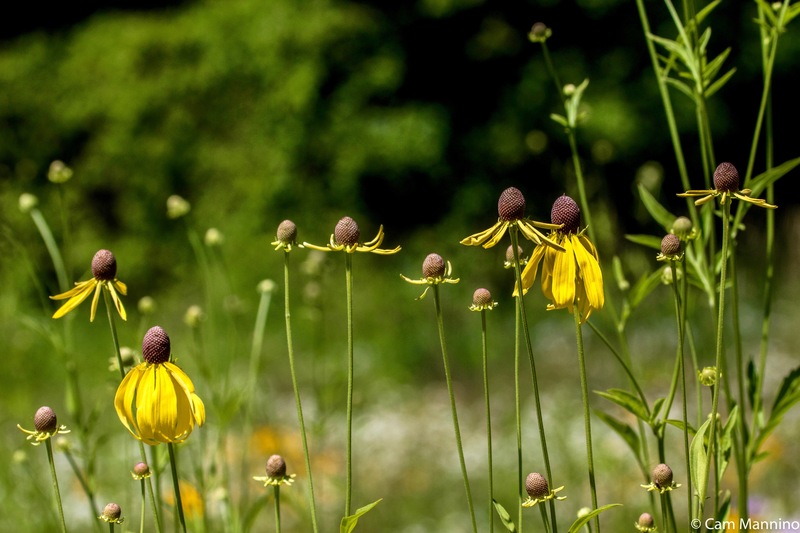 Tall Yellow Coneflowers (Ratibida pinnata) sway in even the slightest breeze. Yellow Coneflowers tower over the carpet of color on the Eastern Prairie at Ilsley. The peaceful beauty of these undulating prairies on a summer afternoon is mesmerizing. The nodding dance of flowers and the flutter of butterflies among them soothe the spirit much like the sight and sound of a peaceful ocean – but with such a variety of color and movement! Wonderful! 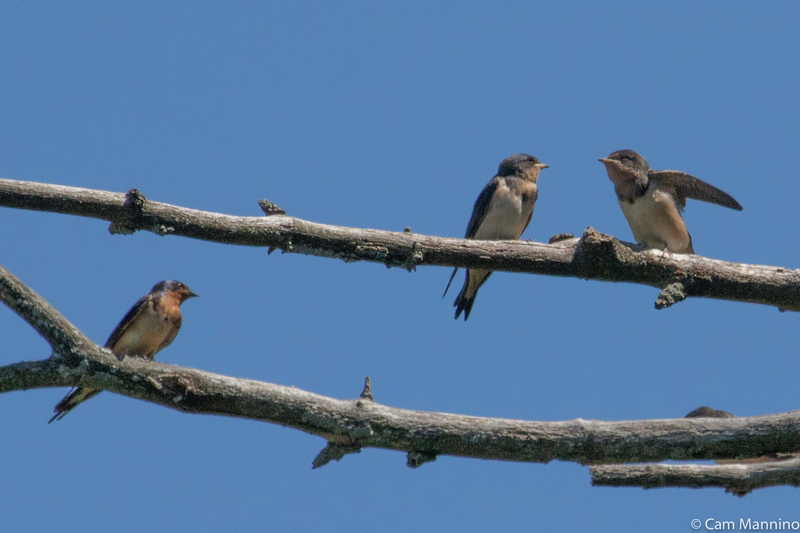 Last Sunday along the entrance trail, young Barn Swallows (Hirundo rustica) perched high on a dead branch, waiting to be fed. They begged in the usual fledgling fashion, fluttering their small wings rapidly and calling. 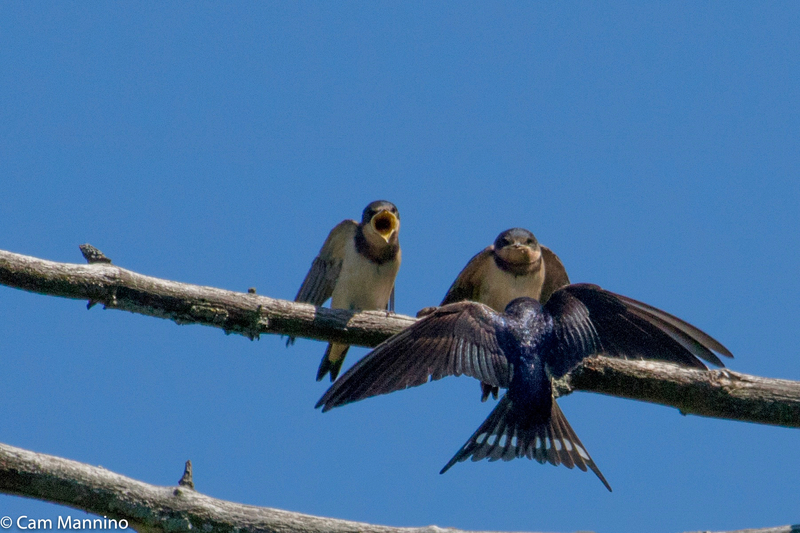 Finally, a parent arrived (lower left in the photo below), settled and seemed to be considering which to feed first. Then the adult swooped out across the meadow, gathering insects in its open beak. It returned and managed a short mid-air pause, beating its wings vigorously as it speedily popped food into one of the open beaks. In the center of the park, where restoration planting happened just weeks ago, the melt ponds are drying up, leaving a strange, foamy surface. Water is so crucial for wildlife that it’s always a reliable spot to find something interesting. A slim bird that I believe was a young Killdeer (Charadrius vociferus), with its naturally worried look, poked along the edge of the pond. 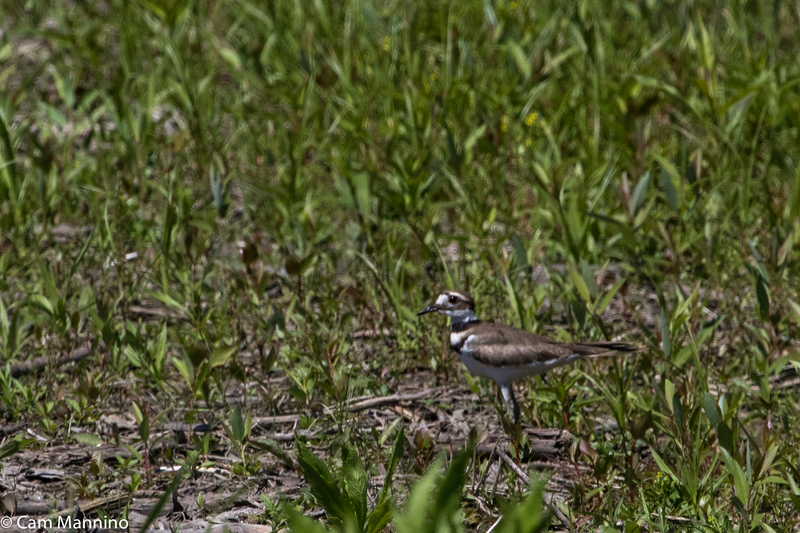 The Stokes’ Guide to Bird Behavior (Vol 2) describes juvenile Killdeer as “very similar to adults except that their upper feathers are margined with lighter edges, their dark neck bands are narrower and often gray or brown instead of black.” I think this one fits that description. Do you agree? Once the young are ready to be on their own, their parents breed again. But the male keeps an eye on the youngsters from the first brood from a distance, while the female incubates the new eggs. A young Killdeer was not quite as adept at finding food yet. Its parent may feed it as evening comes on. Two young bluebirds seem to look around for a parent to feed them. Young bluebirds only have a small bit of blue on their wings at first. Some adult birds hung out near the pond as well. A Green Heron (Butorides virescens) was so intent on feeding that it flew toward us to find some open water. And in flight to the other end of the pond. The fiercely territorial Eastern Kingbird (Tyrannus tyrannus) looked remarkably unruffled by the other species exploring the resources of the pond below. And nearby in a tree at the edge of the center field, an adult Song Sparrow (Melospiza melodia) looked as though it must have been preening vigorously since its feather were very ruffled! Drat those feather mites! 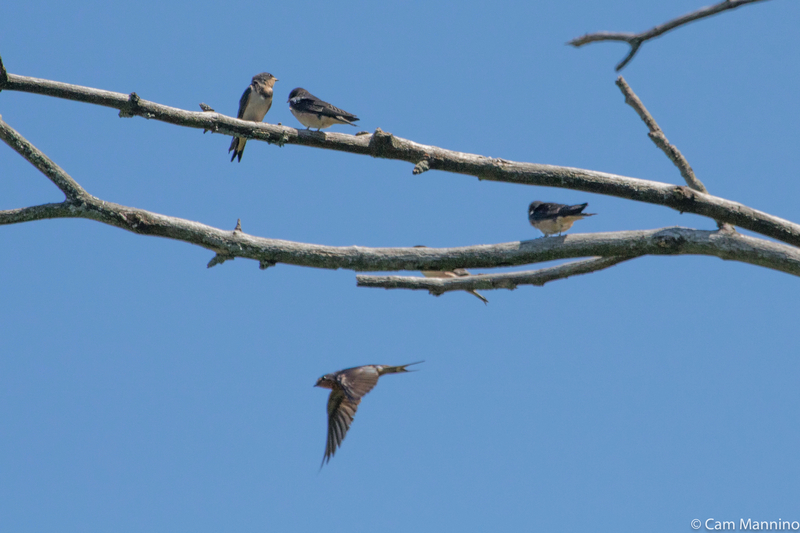 The highly territorial Eastern Kingbird watched the activity with remarkable calm. The ruffled feathers of an adult Song Sparrow might mean it’d been preening vigorously. Summer turned into an unusually busy time for me this year. So I relish escaping into our parks, where I can watch young birds learn the ropes of feeding, or just quietly enjoy the way Yellow Coneflowers sway above a multi-colored prairie. I recommend it to you as a peaceful alternative to a day at the beach. Cam, I love the photos! I’m so excited to see the prairie flowers. Should stop by and see them to compare to what I’m growing in my field. Thanks, Colleen. The north and east prairies at Ilsley are amazing. There’s still some tough non-native Reed Canary Grass in parts of the east prairie to deal with, but the native wildflowers are healthy, bountiful and so beautiful The west prairie was mowed to knock back the invasives. The wildflowers are coming back there now but they’re much shorter. And the prairie path at Draper should be great still too, though I haven’t been there lately. . The bird walk starts at 7:30 at Ilsley this week if you want to come. I’ll have to stop by and have a look at your field!